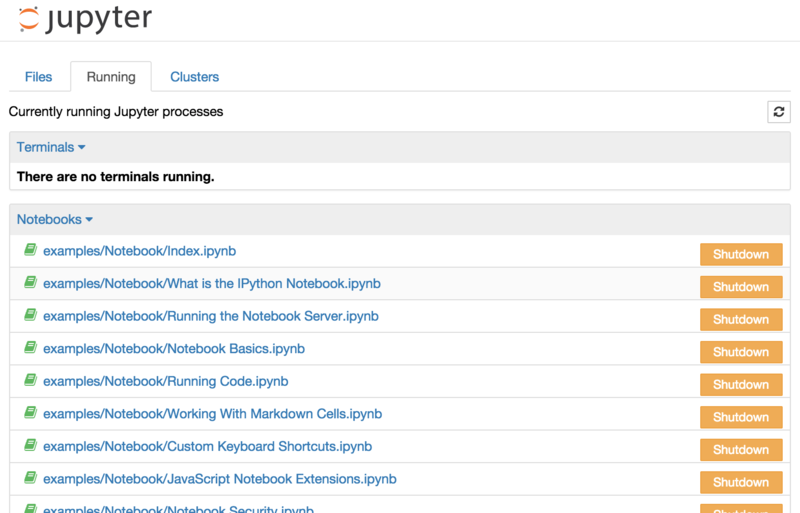 What is the Jupyter Notebook? 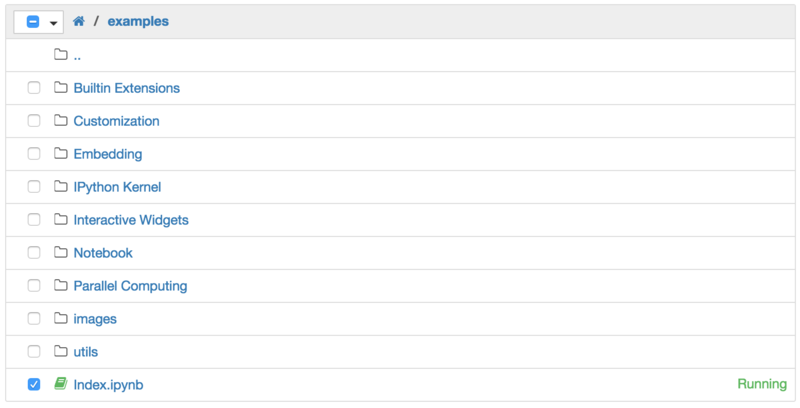 The top of the notebook list displays clickable breadcrumbs of the current directory. By clicking on these breadcrumbs or on sub-directories in the notebook list, you can navigate your file system. To create a new notebook, click on the “New” button at the top of the list and select a kernel from the dropdown (as seen below). Which kernels are listed depend on what’s installed on the server. Some of the kernels in the screenshot below may not exist as an option to you. Notebooks and files can be uploaded to the current directory by dragging a notebook file onto the notebook list or by the “click here” text above the list. The notebook list shows green “Running” text and a green notebook icon next to running notebooks (as seen below). Notebooks remain running until you explicitly shut them down; closing the notebook’s page is not sufficient. To shutdown, delete, duplicate, or rename a notebook check the checkbox next to it and an array of controls will appear at the top of the notebook list (as seen below). You can also use the same operations on directories and files when applicable. This view provides a convenient way to track notebooks that you start as you navigate the file system in a long running notebook server. The notebook has an interactive tour of these elements that can be started in the “Help:User Interface Tour” menu item. 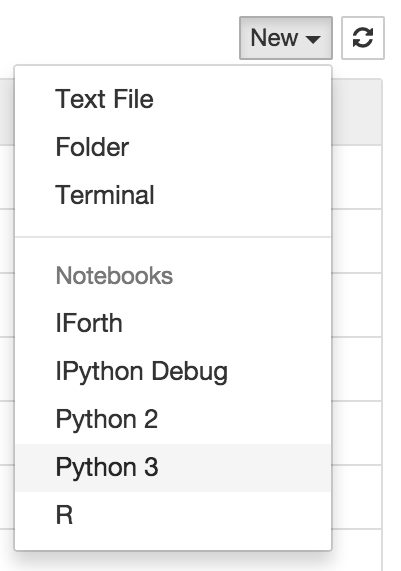 Starting with IPython 2.0, the Jupyter Notebook has a modal user interface. This means that the keyboard does different things depending on which mode the Notebook is in. There are two modes: edit mode and command mode. When a cell is in edit mode, you can type into the cell, like a normal text editor. Enter edit mode by pressing Enter or using the mouse to click on a cell’s editor area. When you are in command mode, you are able to edit the notebook as a whole, but not type into individual cells. Most importantly, in command mode, the keyboard is mapped to a set of shortcuts that let you perform notebook and cell actions efficiently. For example, if you are in command mode and you press c, you will copy the current cell - no modifier is needed. Don’t try to type into a cell in command mode; unexpected things will happen! Enter command mode by pressing Esc or using the mouse to click outside a cell’s editor area. The first idea of mouse based navigation is that cells can be selected by clicking on them. The currently selected cell gets a grey or green border depending on whether the notebook is in edit or command mode. If you click inside a cell’s editor area, you will enter edit mode. If you click on the prompt or output area of a cell you will enter command mode. If you are running this notebook in a live session (not on http://nbviewer.jupyter.org) try selecting different cells and going between edit and command mode. Try typing into a cell. button in the toolbar or the “Edit:Copy” menu item. With this simple pattern, you should be able to do most everything you need with the mouse. button in the toolbar or the “Cell:Run” menu item. To unrender the selected cell, double click on the cell. The modal user interface of the Jupyter Notebook has been optimized for efficient keyboard usage. This is made possible by having two different sets of keyboard shortcuts: one set that is active in edit mode and another in command mode. The most important keyboard shortcuts are Enter, which enters edit mode, and Esc, which enters command mode. In edit mode, most of the keyboard is dedicated to typing into the cell’s editor. Thus, in edit mode there are relatively few shortcuts. In command mode, the entire keyboard is available for shortcuts, so there are many more. The Help->``Keyboard Shortcuts`` dialog lists the available shortcuts. 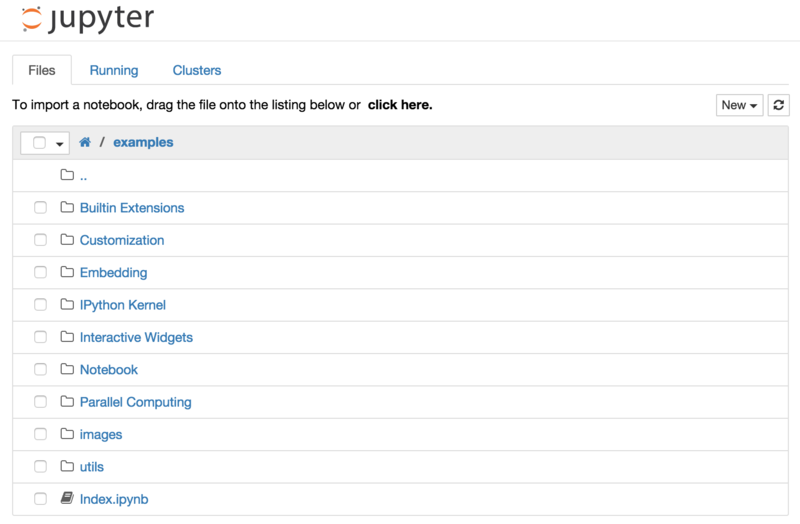 © Copyright 2015, Jupyter Team, https://jupyter.org Revision b8e30ea8.